Logitech has unveiled its latest G-series gaming peripherals, including the G930 headset, the G700 Wireless Gaming Mouse and the G510 Gaming Keyboard. Logitech's G-series have long been favourites for PC gamers and the new troika of peripherals will no doubt prove popular despite carrying hefty price tags. The Wireless Gaming Headset G930 is available for a suggested retail price of £149. The Wireless Gaming Mouse G700 will cost £89.99 and the Logitech Gaming Keyboard G510 is available for £89.99. "The new G-Series products give every gamer a competitive advantage," said Elliott Chin, Logitech's senior manager of product marketing for gaming. "Whether it's a headset with 7.1 surround sound, a mouse with 13 controls, or a keyboard with an LCD that displays critical in-game stats, everything about the new G-Series line-up helps you win, no matter what game you love to play." The Logitech Wireless Gaming Headset G930 brings what Logitech describes as Dolby 7.1 surround sound. The headset has three programmable 'G' keys, memory foam headband and is wireless with a 10 hour battery life. Logitech also points out that you can charge the headset while still using it. Next up is a Wireless Gaming Mouse G700, which may well test gamers' aversion to wireless kit. It has 13 'precisely placed' controls and has a quick connect charging cable. 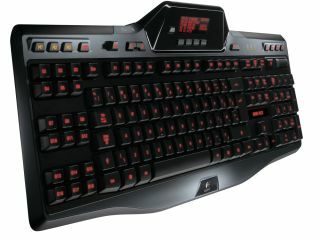 Last but not least the Gaming Keyboard G510 'delivers the tools you need to win' says Logitech. The keyboard features 18 programmable G-keys with three mode states, giving you up to 54 possible macro settings per game. It also includes the much-admired Logitech-exclusive GamePanel LCD to give you real-time game stats and PC performance data. Add in customisable RGB backlighting and 3.5 mm audio jacks and you get a tasty bit of gaming kit.